Week 6: Season Two Episodes 9-12: Torture and Interrogation in the United States: Glamorized or Real? Week 5: Season Two Episodes 5-8: Dana Brody: Anguished Teen or Moral Compass? Week 4: Season Two Episodes 1-4: Is Homeland an Anti-feminist Show? Week 9: Season 3 Episodes 9-12: How Real is the CIA depicted in Homeland? Week 12: Season 4 Episodes 9-12: How Effective of a Female Protagonist is Carrie Mathison? Week 11: Season 4 Episodes 5-8: Winning Game Plan? I was eager to view the last four episodes of Season Two of Homeland, even more so since I had prior knowledge of what will transpire, culminating into the best ending of a season in this series. (Granted I have only viewed the first two seasons so my comparison base is admittedly pretty narrow). Goodness the writers of Homeland certainly have put their creative talents to good use to create an electrifying ending: Brody killing Vice President Walden, CIA operatives finding and killing Abu Nazir (after Carrie insisted they search the tunnels again where she was certain Nazir was hiding), a massive explosion to the CIA facility in Langley, resulting in the murders of over 200 innocent people, Brody being wrongly accused for this horrific terrorist attack, a dissolution of a marriage, and promises of love in a tumultuous and ill-fated relationship. Such storylines would take most serialized television shows a couple of seasons to complete, Homeland accomplishes this in just four episodes. The point of this post is not to discuss all that transpired in these four episodes. After all, my readers have viewed these episodes and certainly do not need me to restate what they know and likely incorporated portions of these episodes into their own writings. Rather I would like to devote this week’s post to torture and interrogation tactics used in the United States. While I shied away from this topic last week, several of my readers encouraged me to pursue this topic at a later date. Given this has been a prominent topic in the public eye with the current administration and Homeland’s portrayal of torture and interrogation tactics in the second season make this a worthy subject to write about this week. The use of torture and interrogation tactics were pervasive in the second season of Homeland, that one has grown accustomed to their occurrences. Viewers watch these scenes for emotional narratives such as the torture Abu Nazir inflicted on Brody when he was a prisoner, Brody being forced to beat Tom Walker while both were in captivity, the questionable interrogation tactics employed by the CIA to the Saudi diplomat and in a particularly violent example, Quinn stabbing a knife into Brody’s hand in an attempt to extract information about his past with Abu Nazir. 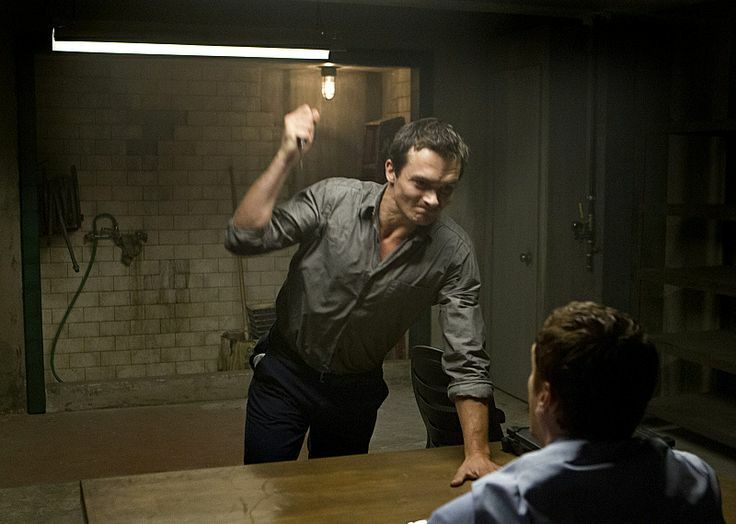 Certainly these scenes contributed to the action and excitement in the second season, however they were not a completely accurate portrayal of the methods the CIA practices during an interrogation (especially when Quinn stabbed Brody’s hand). Much of what the writers and producers embellished in these episodes were to contribute to the storytelling of Homeland’s spy genre. According to Jason Mittell of “The Ends of Serial Criticism”, how Homeland uses these torture and interrogation tactics is a strategy that serial storytelling can emphasize or ignore particular meanings simply by the amount of attention afforded to them through serial reiterations and articulations. Season two occurred in 2012, eleven years after the September 11th terrorist attacks, and national security was still forefront in the minds of Americans. The idea of torture tactics employed by the CIA, FBI, and other government agencies who deal with terrorism, were prominent in mainstream media stories. This issue was then and still is currently a controversial topic as even though the horrific events that unfolded at the turn of the century occurred a decade and a half ago, the war on terror remains a prominent concern to Americans. Homeland’s use of flashbacks to illustrate Brody’s torture in Afghanistan is not merely for additional detail in a vast sea of character information, it helps to shape our view of torture tactics used by Al-Qaeda. This can also help to shape the view of either the series or the U.S. military policy. Although Season Two aired almost five years ago, the current administration has reignited controversy on the United States’ stance on torture. According to an article in “The Atlantic”, torture was a key part of Trump’s national-security platform as a presidential candidate. He publicly defended torture on the trail, proclaiming that “torture works” and “only a stupid person would say it doesn’t work.” Even if it didn’t work, Trump concluded, “they deserve it anyway, for what they’re doing.” One has to wonder if such inflammatory rhetoric were uttered when Season Two aired, what direction the show’s writers would take these torture and interrogation scenes. Would they retract, contradict, revise, or simply ignore these political statements and just let that part of Brody’s history fade into the background? While conducting research for this article, I did not run across any viewers voicing dissent about the current season and Trump’s political utterances on this topic so my assumption is that either Homeland shifted its focus overseas off American soil where the instances of torture would not be such a common refrain or viewers do not find Homeland’s depiction of torture particularly offensive. The CIA has often used Hollywood to present a rosy portrait of its operations. Homeland has become a platform for Alex Gansa (Homeland’s co-creator) to explore all the most compelling and controversial aspects of the war on terror from a reliably pro-CIA point of view. According to Gansa, the show tries in a vigorous way to show both sides of the political spectrum and not be polemic. However as the war on terror endlessly grinds on, it will be interesting to see if Hollywood takes a more critical look at national security. Not just in Homeland, but in other popular television shows or movies that of the same genre.